Viewing 1 current event matching “java” by Date. Viewing 150 past events matching “java” by Date. Topic: Using Groovy to Unit Test Java Code As you know, Groovy is a slick scripting... er, dynamic language that integrates very well with the Java platform and Java technologies. This presentation will go over a way to introduce Groovy into your organization and programming environment via unit testing. After a brief introduction to the language, we'll go over why Groovy can make unit testing easier. Speaker: Howard Abrams Howard jumped on the Java bandwagon during the last millennium and has been working with Groovy off an on for a few years. He currently works for Cordys supporting their business automation process software. If you live in Portland, Oregon - or just happen to be in town - you might want to join us for some beers and tech talk tomorrow (Monday) night. Patrick Lightbody, Howard Lewis Ship and Matt Raible will be meeting around 6:30 at the Rogue Distillery & Public House. Regardless of your affection for PHP, Rails, Java, Selenium, Tapestry or Struts 2, chances are you'll enjoy talking about it with new friends. With 36 taps and the delicious beer from Rogue Ales, this is sure to be a fun night. How do you use Flex? Many people also go for a drink and further discussion following the meeting, at a location determined ad hoc (more often than not, Jax on 2nd). Scala is a new language for the Java Platform that blends object-oriented and functional programming concepts. This talk will focus on the design choices of Scala, and what they mean for developer productivity. The talk will highlight what it means to program in a functional style, and show you how Scala facilitates a hybrid of functional and imperative programming styles. The talk will also explore how Scala compares to dynamic languages such as Ruby and Python. And you'll see examples of real, production Scala code that will illustrate what it feels like to program in Scala. How does performance vary across JVM vendors? How does performance vary across JVM versions? How does performance vary across operating systems? How does the performance of 1.4 features differ from their 1.5+ replacements? How true are commonly held assumptions about Java performance? Can we generate simple rules of thumb for high-performance Java SE programming? There will also be a short discussion of the tradeoffs between micro- and macro-benchmarks. Because this is a work in progress, comments and observations about Project Bonneville's benchmarking methodology, or suggestions for future benchmarks, are especially welcome. Chris promises a LOLCAT-free presentation, though there may be a slide or two of his kids. Many people also go for a drink and further discussion following the meeting, at a location determined ad hoc (lately, the Market Street Pub at 10th and Market: http://mcmenamins.com/index.php?loc=24 ). Instantiations and The Eclipse Foundation will co-host a pizza and salad buffet, including beverages. Come see what’s cool in Eclipse development, and network with your local Eclipse community! Feel free to pass this along to your colleagues, and be sure to sign up on the wiki if you would like to attend or present! We will discuss building a Java Swing application (installed or web start) that saves its data POJOs (Plain Old Java Objects) into SQL databases across the net (mySQL) or to a local embedded database (Derby) by using the JPA (Java Persistance API) and ORM (Object Relational Mapping) via Toplink or EclipseLink. You will see that REAL applications get to benefit from technology that typically lives in the world of Hibernate and Web Apps. You gotta love portable SQL database data persistance without building any tables or writing any SQL! Jon is one of the founders of PJUG 13 years ago, who as a software engineer has been dabbling in code at places like Mentor Graphics and Synopsys, and now designs software for Vigilan in Wilsonville. In his massive spare time he is also a veterinarian, auctioneer, owner of Mock Crest Tavern, and teaches at PCC Sylvania. Google App Engine lets you run your web applications in Google's datacenters. This presentation will focus on App Engine's Java runtime. We'll cover developer tools, the datastore, and core platform services. In addition, we'll discuss how to call third party web services from within the App Engine environment. ATTENTION: For this month's meeting only, we will be meeting in the Jefferson room on the southeast end of the upper lobby. We will not be in the usual 8th-floor conference room! GPC4J is a computing paradigm that breaks a partitionable problem into GridPackets, which are routed, processed and re-assembled into the solution to the original problem. This presentation will cover the use of the system and design of the project's web application. The application is built using REST (Jersey), Maven, Hibernate, JPA, MySQL and GlassFish. Lyle Harris is a Software Engineer working in World Wide Operations at Sun Microsystems, where he develops internal Java applications for automation and customer-facing web applications. Java Enterprise Performance Tuning typically is viewed as someone else's job. QA will do it. Operations will figure it out. Isn't the Dev guys supposed to find these things? But in fact it can and should be done across the lifecycle. Is my Framework doing what I want? Hello? Is this thing (caching) on? Joe Hoffman has been designing, building and debugging Enterprise Applications for over 25 yrs, the last 11yrs in Java. He currently specializes in resolving complex performance problems for large enterprise customers across the globe. He holds a Bachelors in Computer Science and a Masters in Software Engineering but still has a blinking VCR clock. When not walking his dog, he can be found usually losing another game of racquetball. Josh will catch us up on the latest JavaFX release, 1.2, which includes lots of improvements to make JavaFX better for real world apps (speed, more controls, charts and graphs). Josh will also give us a sneak preview of features coming in future versions of JavaFX, along with some great demo apps. Joshua Marinacci first tried Java in 1995 at the request of his favorite TA and never looked back. He has spent the last ten years writing Java user interfaces for wireless, web, and desktop platforms. After tiring of web programming with several large companies in the Atlanta area he joined Sun to work on Java user interfaces full-time, first on the Swing team, then NetBeans, and now on the JavaFX tools team. Joshua recently co-authored O'Reilly's Swing Hacks with Chris Adamson. He also contributes to SwingLabs and writes regularly for Java.net. Joshua holds a BS in Computer Science from Georgia Tech and recently moved to Eugene, Oregon to be with his new wife. Sean Sullivan is a software engineer specializing in mobile applications, web service development, and supply chain management systems. Sean is an Apache Software Foundation committer and has contributed to various open source projects, including the OAuth Java library, OpenID4Java, and Typica. The Spring Insight console, part of tc Server Developer Edition, is a dashboard view of real-time Spring application performance metrics. Without changing their code, developers can use Spring Insight to detect, analyze and diagnose application performance issues right from their desktops. A graphical look at application performance: Within Spring Insight, application performance is graphically displayed via response time charts and histograms, providing developers an easily digestible view into where processing time is spent. Easy navigation to identify the root causes of concerns: Expandable call trees enable developers to drill down into application requests and controller actions. Integration with SpringSource Tool Suite to fix problems: By integrating SpringSource tc Server Developer Edition with SpringSource Tool Suite, developers gain a deeper understanding of how the application is functioning and performing by isolating a transaction trace and quickly jumping to the portion of code that is causing a problem. Steve Mayzak is a Senior Sales Engineer with SpringSource. He has been in working in Enterprise IT for over a decade and has been involved in many industries including Automotive, Retail, Hi-Tech, Healthcare to name a few. Steve is an Open source advocate who loves anything that has to do with Java, Spring and Grails and is an expert at using these technologies to solve real word problems. He is currently focused on showcasing SpringSource products around the world with a focus on tc Server and Hyperic HQ. In the push to make use of tagging and other forms user-driven information architectures, developers have overlooked the value of adding semantics, or contextual meaning, directly to the data that powers web sites and applications. The addition of Microformats to a Web site's markup can further the exchange of semantic information such as contact information for people and events. For the most part, however, web sites and applications are still populated by largely non-semantic prose organized in large blocks of HTML or generated from the walled gardens of relational databases and data warehouses. While everyone agrees that HTML isn't going away anytime soon, several Web Standards have arisen over the last few years to help application developers store, serve, and distribute information with ever-increasing levels of semantics and meaning. The current pinnacle of the Semantic Web Standards pyramid is OWL - the W3C's Web Ontology Language. In this talk I will describe the roots and basics of OWL and how it can be used to power the next generation of smart, data-enabled Web applications. Brian is a technology consultant and developer for Dealerpeak - the Portland-based Web-enabled CRM for automotive dealers. A recent transplant to Portland, Brian formerly led grant-funded R&D projects in the information sciences at Penn State University. He moved here primarily for the high quality and variety of beer. Why is it that the percentage of women graduating with computer science degrees around 50% in countries like Sweden, China and India, but less than 20% in America? As a "Geekdad" with a daughter, I found this unacceptable, and decided to do something about it... I went back to school... elementary school that is, to teach programming to the kids. My goal was to find an environment and a style that would encourage girls with curiosity to enjoy being controlling computers in creative ways, and in the process, encourage and involve every kid. My talk discusses the journey of coming up with a girl-friendly curriculum for teaching programming that boys wouldn't notice anything different. I then show off some of the new crop of "Integrated Learning Environments", i.e. Alice, E-Toys and Scratch. I finally give an overview of my "Computer Club" and how others can use what I've done to teach others. My first job in high school was teaching Basic and Logo programming to 8 year old kids; however, I haven't taught since graduating from college. After programming for 25 years (and Java for 12), I'm now intrigue about returning to my roots and working with the next generation. Many people also go for a drink and further discussion following the meeting, usually at McMenamin's Market Street Pub at 10th and Market: http://www.mcmenamins.com/328 (but sometimes this changes). With over 6.5 million software developers worldwide, Java is used in every major industry segment, running on everything from cell phones to scientific supercomputers. Traditionally, it has been difficult for programmers to take advantage of the multi-core systems with their ever-multiplying number of cores. But that is all about to change with JSR-166y. Targeted for Java 7, scheduled for release in late 2010, JSR-166y adds a lightweight task framework known as ForkJoin (FJ) to the Java platform. Steve Dohrmann will be discussing the fundamentals of parallel Java programming. His talk will include the use of Java threads, an overview of the JSR-166y (ForkJoin) package, and some points on higher-level parallel programming models. If you're a Java developer, you can't afford to miss this opportunity to learn about the future of Java in a parallel world. And developers on other environments will find the overview of parallel application development and solid parallel algorithm fundamentals to be valuable in building systems that scale and provide competitive differentiation for your solutions. Meet the Speaker: Steve Dohrmann, Software Engineer, Intel Since joining Intel in 1994, Steve has worked in a variety of research, advanced development, and product groups within the company. He is currently working in a Java technology group and is focused on data-parallel programming for the Java VM. Intel will be giving away a brand new laptop for a door prize! Cost: $5 student rate / $20 member rate+ / $30 non-member rate student rate, sponsored by Intel. Use code: school Students must register using their school email address. This month's topic: Rich Internet Clients: A moderated, but open discussion on what is the "right technology" for an internet application. Bring your opinions, experience and personal bias and join in a lively discussion on a highly pertinent topic. Topical questions include but are not limited to: Applications written using HTML, CSS and Java Script (DHTML) have some advantages but what requirements, if any, would sway a project towards -Flash, Applets or Java F/X? Is there significant differences between consumer versus business based applications that would cause cause a particular technology to be used? Are they days of Flash numbered or is the current trend towards pure DHTML doomed because of fragmentation in the browser market? This month's topic: High-Tech Block Party! Java developers, architects, programmers, and enthusiasts: get ready for a real adrenaline rush. The Java Road Trip: Code to Coast tour is visiting 20 cities across the United States showcasing Oracle's commitment to everything Java. Heading up the tour are key Java technologists from Oracle, who will be demonstrating the latest Java software, engaging with Java User Group (JUG) members, and meeting with enterprise developers and consumers. 701 SW 6th Avenue (bordered by SW Yamhill, SW Morrison and SW Broadway) Portland, OR 97205. This high-tech block party on wheels is your chance to share the spirit of innovation that is the essence of Java. Brent Christian, a Senior Member of Technical Staff with Oracle, will be doing technology demos for the Portland event. In his 10+ years with Sun, he worked on Client Java technologies which included the AWT and Swing toolkits, as well measuring, analyzing, and improving client performance. He has spent the last few years on the JavaFX graphics team, focusing on the animation system along with performance benchmarking and analysis. Java developers, architects, programmers, and enthusiasts: get ready for a real adrenaline rush. The Java Road Trip: Code to Coast tour is visiting 20 cities across the United States showcasing Oracle's commitment to everything Java. Heading up the tour are key Java technologists from Oracle, who will be demonstrating the latest Java software, engaging with Java User Group (JUG)members, and meeting with enterprise developers and consumers. Almost every transaction executed on a Java EE Application Server winds up distributed over multiple resources such as JMS destinations and JDBC datasources. Standard OTLP systems employ the XA-2PC protocol, a presumed-abort variant of the Two-Phase Commit protocol to make sure that either all resources commit successfully or all resources abort the transaction if at least one resource fails. As any distributed consensus protocol, XA-2PC is expensive. In this talk, we present Logging Last Resource (LLR) optimization of XA (actually, its Java EE "translation" in form of the JTA spec) in Oracle WebLogic Server. LLR's effectiveness has been validated in world record results achieved by the Oracle stack in the SPECjAppServer2004 benchmark and by high-profile customers in mission-critical applications. Gera has worked in the areas of workflow management, temporal databases, messaging, and recovery. He is currently with Oracle Database High Availability. In his prior role at Oracle, he was part of the Java Platform Group where he worked on the messaging infrastructure such as OC4J JMS, AQ JMS integration, WebLogic FileStore, and LLR. Prior to joining Oracle, Gera worked at the Max Planck Institute of Informatics in Saarbruecken, Germany and interned at Microsoft Research in Redmond, WA. Many people also go for a drink and further discussion following the meeting, at a location determined ad hoc (lately, Trees restaurant in the same building). Doug will present his notes (PDF) from this years JavaOne (and Oracle Dev) Conference. Come listen and share! There will also be free pizza and beers. The event is scheduled for this Monday, Nov 8th at 6pm at the Lucky Labrador Beer Hall, 1945 NW Quimby (map). Please RSVP on the wiki. Come to the session if you want to participate in learning more about Gradle. Gradle is a powerful layer of Groovy built on top of a number of established tools and libraries. Smart guys have borrowed from the pioneering work of Ant, Maven, Gant, Buildr and come up with an expressive, concise, and convention-rich build tool for the Java family. For this session, there won't be any slides. I'm also not going to stand up and talk at you. Instead, I'm going to rely heavily on your involvement. I'll start with an introduction to Gradle, and then very quickly go into using it in practice. After a few minutes of that I'll open it up to go wherever we're most interested in. I'm not a Gradle expert, yet I believe that my Groovy background in conjunction with a few days of earnest usage have taught me a lot. This session will rely heavily on an internet connection, and we'll be googling for answers together if need be. What is your intention for the session? Spend some time deliberately focusing on what it is you want out of the session. Bring that will you and share it with us. It will help us all focus on what's important and go some way to helping you get the most out of the session. Also, go have a quick read about Gradle on their website. That will save us all some time, help us get to the interesting details sooner, and be a good source of informed questions for you. I'm Merlyn, a Portland-based programmer with strong ties to both Agile PDX and Groovy. I'm also a member of an Agile team at YesMail, and I blog under the handle "curious attempt bunny". PDXScala is the Portland, Oregon based Scala users group. The meeting will be at BankSimple, please use this door -- there will be a "PDXscala" sign on it. PRESENTATIONS * Scott Andreas showing off the Scala port of his Octobot project, which was recently deployed successfully to handle a heavy job processing load at UrbanAirship. 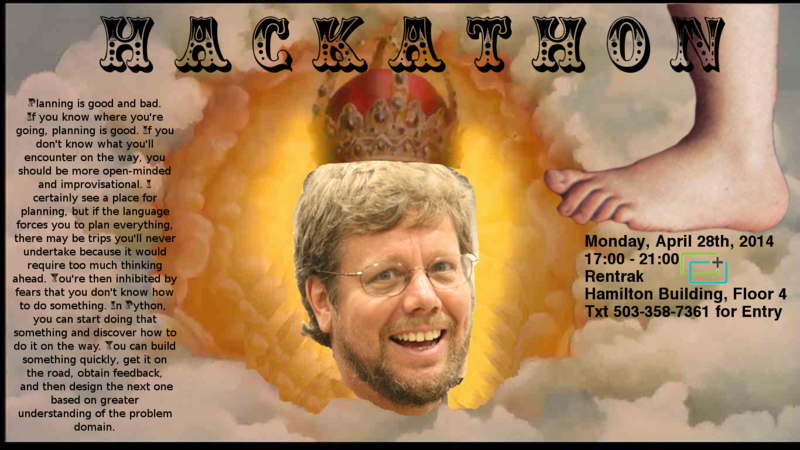 * Stephen Judkins will also show off some work he's done to integrate JRuby and Scala. 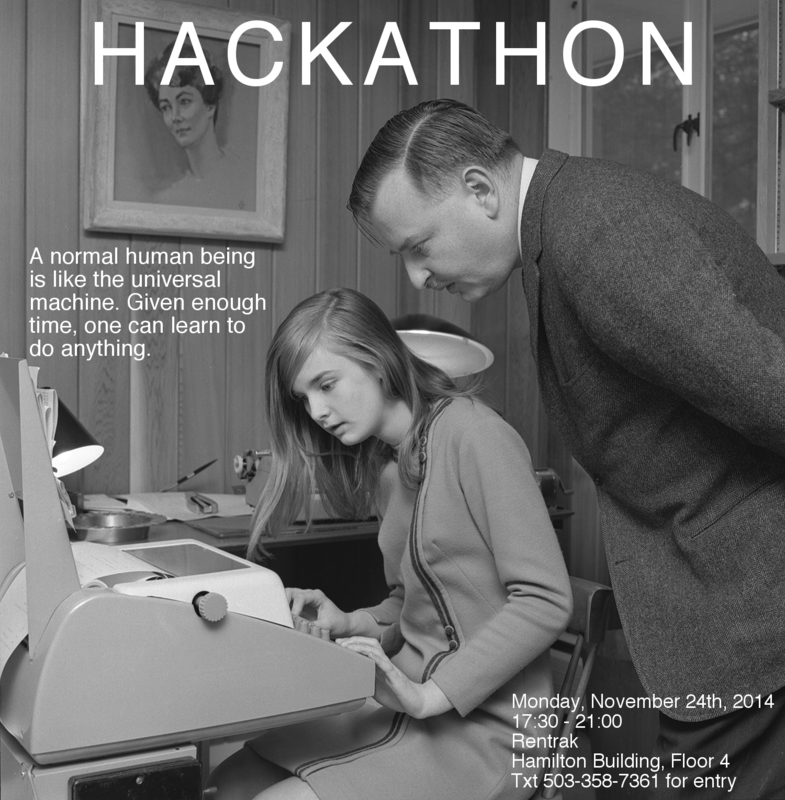 * If you have any topics you'd like to discuss or code you'd like to show off, please bring it along! The NoSQL movement has given developers many more data storage options, each with their own design considerations and trade-offs. One of the quieter options, semantic data stores (also called triple stores or quad stores), provide an interesting hybrid of key-value and graph database features, while offering a data model based on a W3C recommendation (RDF) and a standardized query language (SPARQL) that will feel familiar to anyone experienced with unfashionable SQL. This talk will cover the basics of data modeling with RDF and how to use the open source Jena Semantic Web Framework to add a semantic datastore to a Java-based Web application. Brian is an independent software consultant based in Portland, Oregon. His current projects include interactive data reporting tools the services for clients in the higher education, automotive sales, and legal sectors. Google unveiled Android 3.0 in February 2011. This release provides a new UI and other features that are suited for mobile tablet devices. In this presentation, we'll discuss Android's new platform API's and highlight changes in the developer SDK. Sean is a software engineer specializing in web services development, mobile applications, and supply chain management systems. Sean is an Apache Software Foundation committer and has contributed to various open source projects, including the OAuth Java library. For the Java coder, GWT is currently as close as it gets to a multi-platform solution for web apps. After a quick GWT review, we will code about in the world of web apps you can run on your desktop and mobile phone, written in Java. This will be a superview presentation touching on GWT, GWT mobile libs and HTML5. Jon is one of the founders of PJUG, writing Java apps since 1995. He has written Java programs for a wide variety of applications from IC Design, circuit board layout, hardware/software co-design, assisted living facilit management, to a POS system for the two bars he owns. May 17, 2011 Portland Java User Group: What's inside a JVM? This month's topic: What's inside a JVM? Are you interested in learning what a Java Virtual Machine (JVM) is and what it does for your Java applications? This presentation will provide insight into the inner workings of a Java Virtual Machine and some drill down on what compilers and garbage collectors do, so that you don't have to worry about it while programming your Java application. Eva has been involved with Java virtual machine technologies, SOA, Cloud, and other enterprise middleware solutions for the past 10 years. Joined the startup Appeal Virtual Solutions in 2001, as a developer of JRockit JVM, which later was acquired by BEA Systems. Eva holds two patents on Garbage Collection heuristics and algorithms, and pioneered Deterministic Garbage Collection which later became productized through JRockit Real Time. Eva has worked closely with Sun and Intel on many technical partnerships, as well as various integration projects of JRockit Product Group, Weblogic, and Coherence (post the Oracle acquisition in 2008). Most recently Eva joined Azul Systems in 2009, as the Product Manager for the new Zing Java Platform. This talk will provide a overview of Urban Airship's core data warehouse architecture - a system designed to handle capture, intake and analysis of data for 100s of millions of mobile devices with near real time precision. The talk will touch on Urban Airship's use of HBase, Hadoop Core, ZooKeeper, Kafka as well as home-grown services. Time permitting, the talk will also cover how Urban Airship takes a lean approach to working with volumes of data including the use of ad-hoc tools such as Pig and Cascading as well as how the company leverages the data architecture for fast customer discovery and innovations. Erik Onnen is the Hadoop and Analytics Lead at Urban Airship, the Portland-based leader in mobile application engagement services. He has over 10 years in distributed systems experience including the design and implementation of multiple "big data" systems. Erik joined Urban Airship in October of 2010, prior to that he was a Principal Engineer at Jive Software. JSON has become the de-facto data interchange format for Internet web services. We'll examine open source libraries that make it easy for a Java developer to serialize objects to JSON. This presentation will include a discussion of three popular Java libraries ( json.org, Jackson, and GSON ) as well as a popular Scala library (lift-json). Sean is a software engineer specializing in web services development, mobile applications, and supply chain management systems. Sean works on e-commerce projects at Gilt Groupe's Portland office. Sean is an Apache Software Foundation committer and has contributed to various open source projects, including the OAuth Java library. Many people also go for a drink and further discussion following the meeting, usually at Tree's restaurant in building lobby. The OSCON JVM Language Symposium is a free, open-spaces conference for implementers and users of different languages on the Java Virtual Machine. We will have several of the biggest names in JVM languages in attendance, and an open format where you can propose and lead sessions, or simply hang out and hack on a new or interesting language idea. This means we will have no planned agenda for the conference and it will be decided by the attendees. Some of the languages you can expect to learn about include: Scala, Clojure, Groovy, JRuby, Fantom, Gosu, and (insert your favorite JVM language here). This is a free event happening the Sunday before OSCON Java (registration for the OSCON Java conference is not required). We are holding this in the OSCON Java space at the Oregon Convention Center, so we will have plenty of space to hack and collaborate. Apache CXF offers the most flexible support for both REST and SOAP of any Java web services stack, including support for different XML data bindings and JSON output for REST web services. In this presentation you'll see how to implement and deploy CXF web services, using both Java standards including JAX-RS and JAX-WS and custom CXF extensions. You'll also learn about the different configuration options supported by CXF, including Spring-based, annotation-based, and direct configuration in code, and get an idea of how easily web services projects can be implemented using CXF. Finally, you'll see how CXF fits into the Apache open source SOA infrastructure. Dennis Sosnoski (http://sosnoski.com/) is an internationally recognized expert on SOA and web services in Java. He's been helping organizations worldwide with their XML and web services projects for the last 12 years. Dennis is also active in the Java community, as a frequent speaker at users groups and conferences, a writer for IBM developer Works Java and SOA/Web services zones, a committer on both Apache Axis2 and CXF web services projects, and the lead developer of other open source projects including the JiBX XML data binding tool. Douglas Bullard has been writing Enterprise applications in Java and associated technologies for 15 years. He has spent the last 10 years at Nike working on Nike.net - Nike's B2B e-commerce site. Come and work on your personal Android projects in a workgroup. Share what your doing, ask questions, help others. All skill levels, including beginners, are welcome to attend. Confirmation of attendance is suggested but not required. If no one shows by 5:30 pm, the meeting will be automatically canceled unless otherwise noted on the website. Please check the group's website for last minute updates. Meet along the back wall near an open power outlet. A small temporary sign will be visible if you look carefully. Discussion topics may be pre-suggested on the group's site, but the main focus of the meeting is coding personal projects. James Price joined Clearwater Analytics in November 2004 and has been the Director of Development for over 6 years. James brings more than 13 years of experience in software development, having previously worked at Hewlett Packard and CQG Inc. as a developer and lead architect. We will be discussing 2 open source portlets for Liferay that I recently created which integrates Twilio and PubNub. Twilio provides infrastructure APIs for businesses to build scalable, reliable voice and text messaging apps. PubNub provides eal-time push notification PLUS unique device to device mass broadcasting. We'll look at easy of use of these 2 APIs and the Spring MVC portlets that wrap them. Chris is co-founder and CEO of Pure Src (pure source), an enterprise portal implementation and development group, and the Portland Liferay User Group Founder. Prior to forming Pure Src, he was senior web architect at Rbx Global a mid-size software engineering firm supporting educational and government agencies. Chris has been actively involved in Open Source development for more than 9 years, committing or contributing to to projects like the Apache UIMA project and Liferay. Chris currently lives in Portland, OR and spends his time playing Soccer and chauffeuring his kids to Soccer and Gymnastics when he’s not programming. Heroku is a Polyglot Cloud Application Platform that supports Java, Scala. This session will teach you how to deploy apps using a "git push". The session will also address the importance of the share-nothing architecture for cloud scalability and alternatives to sticky sessions and session replication. James Ward (www.jamesward.com) is a Principal Developer Evangelist at Heroku. Today he focuses on teaching developers how to deploy Java, Play! and Scala apps to the cloud. James frequently presents at conferences around the world such as JavaOne, Devoxx, and many other Java get-togethers. Along with Bruce Eckel, James co-authored First Steps in Flex. He has also published numerous screencasts, blogs, and technical articles. Starting with Pascal and Assembly in the 80's, James found his passion for writing code. Beginning in the 90's he began doing web development with HTML, Perl/CGI, then Java. After building a Flex and Java based customer service portal in 2004 for Pillar Data Systems he became a Technical Evangelist for Flex at Adobe. You can find him tweeting as @_JamesWard, answering questions on StackOverflow.com and posting code at github.com/jamesward. In November 2011, Gilt Groupe announced the availability of International Shipping on gilt.com. This feature was jointly developed by Gilt's New York and Portland engineering teams. Key pieces of this project were written in Java and Scala. Join us for a discussion about the production rollout strategy for this feature. This month we are going to talk about Android test automation! Jim Eisenhauer will be showing off his Farmville Tweeter Bot using the Selenium webdriver Android Driver and Andy Doan will be discussing and demoing Android native app automation using nativedriver. Mobile phone texting (txting) is now ubiquitous - a comfortable UI to everybody that has a cell phone. With most age groups, the time spent texting far exceeds time making voice calls. Logically, Java developers should be considering txt interfaces to their applications. Jon is the founder of PJUG and Java architect and UI developer for RealPage in Wilsonville, OR. He has been writing in Java since his first taste in version 0.9, 17 years ago! In addition to being a code monkey, Jon is a licensed Veterinarian, owns two bars, is an auctioneer and in his spare time teaches Human Anatomy and Physiology at PCC. Having never missed a JavaOne since their inception in 1996, he hopes to see you there in the Fall! Come and work on your personal Android software development projects in a workgroup. Share what your doing, ask questions, help others. All skill levels, including beginners, are welcome to attend. Confirmation of attendance is suggested but not required. You are welcome to show anytime, but If no one shows by 6:30 pm, the meeting will be automatically canceled unless otherwise noted on the website. Please check the group's website for last minute updates. Meet the experts behind the leading open source cloud platform for enterprise applications, discuss the latest innovations with other developers and expand your opportunities by attending the Cloud Foundry Open Tour. Topic: Software Estimation Software estimation is always difficult to do well. Estimation is rarely taught in school and gets little attention in professional training. This presentation, built heavily on material from Steve McConnell, delves into the topic with the goal of improving estimation with a few simple rules of thumb as well as improving the understanding of the culture and politics surrounding estimates that often cause conflicts. Speaker: Chris Kessel I've been a developer for just shy of 20 years and started with Java shortly before its original 1.0 release. I'm passionate about the craft and maintain an active interest in software history and culture, especially as it impacts best practices. Dropwizard is a Java framework for developing ops-friendly, high-performance, RESTful web services. The library was developed at Yammer and has been adopted by Simple (formerly BankSimple) and the Gilt Groupe. We will discuss how Gilt is using Dropwizard and why we adopted the library. Sean is a software engineer specializing in e-commerce systems, web services development, and mobile applications. Sean works on back-office applications at the Gilt Groupe and has contributed to various open source projects, including the OAuth Java library and OpenID4Java. Many people also go for a drink and further discussion following the meeting, typically at a nearby location determined ad hoc. JavaFX 2 is the future of RIA development. It takes the power of a modern scene graph, adds rich animation and multimedia capabilities, and extends to the web and beyond with seamless portability. At the same time, it leverages the power and breadth of the Java language and platform, allowing full access to existing Java libraries and integration with Java client technologies like Swing. This session will introduce you to the JavaFX 2 platform from the perspective of a seasoned Java developer. The breadth of JavaFX APIs will be explained through several examples that we will build out during the course of the session. In addition, we will showcase SceneBuilder, the new JavaFX-based GUI building tool for rapid application development. If you have heard about JavaFX before, but were not sure about taking the plunge, now is the time to see what you have been missing out on. This talk will provide a theory of operations, systems description and possibly a demo of a live system. All code will be made available on Github. James Perkins is a software engineer at Red Hat and a core engineer for the JBoss Application Server and JBoss Logging projects. Doors open at 6 PM. The meeting will start at 6:30 PM. Pizza provided by Tek Systems. Java bytecode just works. It works so well that the JVM has over 250 languages that compile to bytecode. It works so well that we can usually ignore it. But given Java bytecode's success and ubiquity, shouldn't we crack the hood and see how it works? Once you do, you may discover that bytecode manipulation is not only fun, it can be used to solve interesting problems. In this session, we will take a look at how bytecode is represented and how to use the ASM library to view and manipulate it. We'll use the Java Instrumentation API to modify classes as they're loaded and change their behavior. First held in 1999 for developers and users of the Apache Server to meet face-to-face, ApacheCon is the official conference, trainings, and expo series of The Apache Software Foundation (ASF), and is the public showcase for Apache innovations. Apache products power over half the Internet, petabytes of data, teraflops of operations, billions of objects, and enhance the lives of countless users and developers. ApacheCon brings developers and users together to explore key issues in building Open Source solutions "The Apache Way". With hundreds of thousands of applications deploying ASF products and code contributions by more than 3,500 Committers from around the world, the Apache community is recognized as among the most robust, successful, and respected in Open Source. Java gets used everywhere and for everything, a reality that can be explained by its efficiency, its portability, the productivity it offers developers, and the platform it provides for application frameworks and non-Java languages. But all is not perfect; developers struggle against Java's greatest strength: its memory management. We'll talk about where Java needs help, the challenges it presents developers who need to provide reliable performance, the reasons those challenges exist, and how developers work around them. And we'll take a little time to talk about Azul Systems, its history of tackling Java scale issues and how it addresses the mismatch between Java and big data. You can think of Vert.x as an Actor-model-based, functional event-driven, messaging passing platform that speaks in modern protocols (JSON, WebSockets, etc) and can be used from many JVM based languages but bridges the communication gap between the browser and the server in a new way. Convincingly Vert.x is like a Node for the JVM, but with some fun enhancements. Come and learn how Jama is using Selenium WebDriver to test their massive single-page web application. We'll look at strategies and techniques for avoiding timing issues, test fragility, and other common pitfalls, We can also look at how Jama integrated writing these tests into their process, as well as answer any other questions you may have. 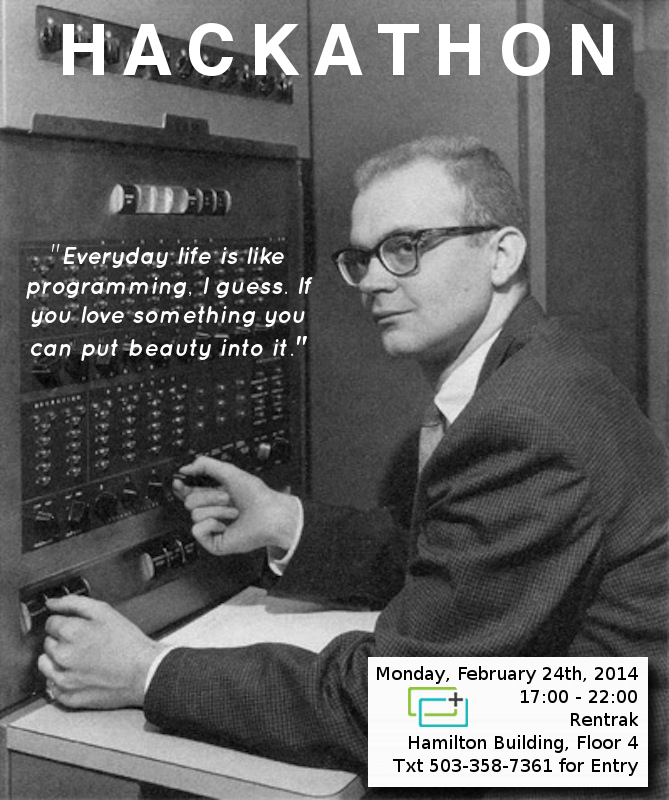 The Rentrak Hackathon is a gathering of laptops and laughter. Classically, we all sit in a square and type words onto a keyboard that then get turned into a "computerized program". It's a good chance to work on your personal projects, learn what your peers are up to (computer-wise), figure out what the best programming language is, and/or say the words "I don't have anything to work on" or "I forgot my laptop". This event is very informal, and there is no specific project we'll be focusing our efforts on. Food and refreshments are served. RSVPing to [email protected] is appreciated, but not required. Come check out Rentrak's new downtown office. Everyone is welcome to join us! The most popular & scalable computer language in use today and the language used on the AP Computer Science Exam. This session is hands-on, it is designed for immediate feedback throughout the course, allowing for students to have fun creating with Java and removing much of the frustration normally associated with computers. See how rewarding & accessible programming can be. Students will learn clean coding techniques and proper use of advanced tools. Register for a free ticket with the Event Brite link above. Ages: 11-18 Requirements: Please bring a laptop setup with code & eclipse from the "more information" link below. Note: we will be pairing durning the event, so kids will share laptops. This means we might not use your actual laptop and that if you don't have a laptop you can still join and participate. Adults: Every child must be accompanied by an adult. Adults are welcome to particpate as well, although we ask you to pair with other adults instead of with your kids. Llewellyn Falco learned to jump horses in the 7th grade while living in France. Back in states, while studying drafting in high school, he started fire eating, sleight of hand magic, and once rode a unicycle 6 miles. After learning to juggle torches, he joined a acrobatics group in college where he specialized on the trampoline and walking a slack rope. He can calculate the cube root of any perfect cube under 1,000,000 in his head, as well as pick a standard lock. He can rollerblade down a flight of stairs, backwards. Later, he has learned to play the doumbek (a type of drum), to accompaniment a belly dancing girlfriend. Llewellyn studied Tai Chi for 2 years, can throw a knife at 20 feet, and a playing card at 50. He has taught swing dancing, and loves to salsa. He is also an accomplished speed chess player. In the last year, he has been scuba diving over 20 times, become a guitar hero, and broke his personal record of paddle balling over 200 times. Llewellyn attributes his success to the large amount of caffeine he has consumed, and enjoys computer programming in his spare time. Gilt is an online retailer based out of New York City. Gilt's main site, gilt.com, offers luxury apparel and home furnishings. This talk will discuss how Gilt.com supports taxes and payments. We'll discuss Gilt's checkout system and order processing backend. Sean Sullivan is a software engineer specializing in e-commerce systems, web services development, and mobile applications. Sean works on back office applications at Gilt. Sean has contributed to various open source projects, including the OAuth Java library, OpenID4Java, and OpenCSV. Join beginning and experienced mobile developers to work on projects together. Come ask questions, give help and get help. All levels of experience are welcome. Class starts May 12th, but you can get previews of the lectures early. The class is free and so is getting help with homework though our workgroup. The group is very informal and so feel free to show up early or late and leave early or late, as suits your schedule. We will meet near the power outlets by the clear glass windows. Look for the orange backpack to find us. Recommender Systems Overview - a quick recap of my January talk on Intro to Recommenders. Apache Mahout – A production-grade Machine Learning system. One of Mahout's strong use cases is building recommenders. Spring XD - A Spring.io project to simplify the development of big data applications. Bob Brehm is a Java software developer in the Portland area. Most recently he has been contracting with Nike on their Go To Market team. Bob had dabbled with Java since the early days and got serious about it in 2002. Bob is keenly interested in and has decided to specialize in Enterprise Search, Recommenders and Big Data. Bob is married and has lived in the Portland area since 2001 when he relocated from Rochester, NY. He believes strongly that rain is better than shoveling snow any day! In his spare time Bob enjoys a diverse number of hobbies including electronics, open-source projects, reading, exploring Portland, and sports. This talk covers using JAX-RS and Jersey to create REST services for embedded system. It covers the basic of JAX-RS and then moves into using Jackson for JSON encoding and using the streaming API to reduce memory footprint for using REST API in embedded systems. Brian Mason holds a Masters in Comp Science from Univ of IL. He has been developing for 25 years and currently works as developer at Netapp Inc.
Abstract: The vast majority of code in this world doesn't do very much. Most code calls into a database, tweaks a few domain objects, and renders an HTML page. This talk is not about that kind of code. Sometimes your code has to go fast, as fast as the machine will run it. Which turns out is really fast in 2014. Faced with this challenge, you might reach for C, or god forbid, C++. But wait, despair not. Your life doesn't necessarily need to devolve into memory management and template hell. There is another path: Java. It turns out that if you start with the right kind of raw material with some tweaking and tuning you can turn this lowly blue collar grocery getter into a fire breathing dragster. I'll share theory, experience, and working code from one gearhead to another. After 4 years of incubating in my basement, Glowroot is ready to go out into the wild and take on difficult performance issues and sporadic errors with its GUI configurable trace and metric definitions and its core plugin support for servlets and JDBC. Trask Stalnaker is a 16-year Java programmer, author of Glowroot, Portland native and alumnus of Stanford University (BS Mathematics). Jul 23, 2014 ForgeRock's 3rd annual social July 23rd at Kell's Irish Pub! ForgeRock welcomes you to our 3rd annual social at Kells Irish Pub, 112 SW 2nd Ave, Portland, Oregon 97204. Free beverages to guests wearing a ForgeRock wristband! Be sure to look for a ForgeRock staff member passing out wristbands during OSCON to gain entry into this exclusive event! The API for Bodybuilding.com serves more than a hundred million API calls everyday across hundreds of servers. Learn how we use Hystrix to build a distributed system that is both fault and latency tolerant. We will discuss the bulkhead and circuit breaker patterns used by Hystrix to provide a resilient and fast API. I've been at Bodybuilding.com for 5 years. I'm currently the Engineering Manager for our Community API teams. Our API does over 100 million requests every day, so we have a heavy focus on performance, scalability, and resiliency. Prior to joining Bodybuilding, I was an engineer at MarkMonitor, a domain registrar for large corporations including Google, Facebook and Yahoo. Grails Grown Up: How do we get sub 500 millisecond response? How do you handle 8-10 million monthly unique visitors with Grails? Build pages using concurrency, SOLR, SQUID, and RESTful services on Grails, that's how! This talk was given in 2012 at UberConf and at SpringOne2GX and has been updated to also discuss the extension of this platform to support PicPackApp.com a combination of native mobile applications and a responsive Angular.JS web interface. He is currently the General Manager for VirtualTourist.com, HolidayWatchdog.com part of the TripAdvisor Media Group Companies. In 2008, VirtualTourist.com was acquired by TripAdvisor(TRIP)/Expedia(EXPE), and Todd was brought in to lead a team of Java/Groovy/Grails engineers in the redevelopment effort. A graduate of the University of Arizona, with a B.S. in Computer Engineering, and an MBA from ASU with an emphasis on management of the creative software engineering process. When he is not actively writing code for his own startup ideas, you will find him entertaining his daughters or getting lost in a glass of wine, both of which usually lead to other crazy startup ideas. Microbenchmarking is fraught with peril. Method inlining. Dead code elimination. Constant folding. False sharing. Loop unrolling. Bimorphic and megamorhpic call sites. This talk explores these fantastic mysteries using JMH, the excellent microbenchmark harness from Oracle developed under the OpenJDK project. Runtime annotation can be slow. Learn how annotations can be used during compilation rather than runtime or just as documentation. We'll have a look at the annotation processing API (JSR 269) and look at some practical examples. James Perkins is a software developer at Red Hat working remotely from Portland, OR. He works on the WildFly Application Server, JBoss EAP, logging frameworks and JBeret (a JSR 352 batch implementation). Steve will discuss NOSQL, CAP Theorem, eventual consistency, and data modeling techniques in Cassandra. Following that will be a demonstration of some shell commands to create and query tables. We will discuss wide and narrow rows in Cassandra, storage options, and capacity planning. We will take a brief look at Titan, a graph database that can use Cassandra as a backing store. We will take a look at partition keys, clustering columns, time series data, and how these choices affect the storage and performance of the solution. We will discuss some of the real world challenges that come up, the trade offs associated with materialized views, plus compare and contrast this to a typical relational model. Time permitting we will discuss some real world use cases, and how Nike Social is using Cassandra to meet them. Steve Hall is a software engineer with over 15 years of experience. Steve is currently a full time engineer with Nike Digital, where he focuses on REST, social networks, and social network integration. Curious about what Microsoft has to offer the Java community? Join us to explore the tools and technologies Microsoft provides Java developers get in the cloud with Azure. We'll demonstrate how to deploy Java web applications and become familiar with cloud service configurations for load balancing, session affinity, in-memory caching, and remote debugging. We'll also discuss the logistics of managing Azure deployments with firewall rules, environment variables, and remote access. Finally, we'll walk through coding exercises using the Azure SDK for Java to demonstrate how to use cloud services for message queuing and data persistence. At the end of this talk, you will have a basic understanding of how to develop, deploy, and manage Java applications for the Azure ecosystem. Ian Downard is a polyglot programmer with a penchant for C++ and Java. His career has focused on developing tools for optimizing the performance of networks and applications. He is employed by Riverbed Technologies as a technical marketing engineer and holds an M.S. in Computer Engineering from the University of Missouri. His participation with social media is primarily at @iandownard on Twitter. May 19, 2015 PAzUG: "Java on Azure – Tips, tricks and tools"
Brian Benz will show you the latest tools for developing with Java on Azure, including the latest updates to our Plugins for Eclipse and IntelliJ, options in Windows and Linux for authentication, security, and continuous integration, an introduction to the Azure Java Developer Center, the Azure SDK for Java, and other tools and materials we've developed for Java developers with help from the community. Expect lots of working examples showing tips and tricks for building, deploying, connecting, and maintaining Java applications on Azure, including multi-tier, and multiplatform Web applications that access data, servers and services in the cloud. About the Speaker: Brian Benz is a Senior Technical Evangelist for Microsoft Open Technologies, Inc., a subsidiary of Microsoft Corporation. These days Brian spends his time helping open source software developers and customers recognize the value and benefits of working on the Cloud with Microsoft Azure, open source software and devices. But most importantly: how you can join this exciting community to work on the bleeding edge in-memory platform. Anthony Baker has over 20 years of experience in fields ranging from high performance computing to interactive television and massively parallel embedded processor arrays. Anthony enjoys algorithms, API design, and obscure concurrency bugs. He is currently a member of the GemFire engineering team at Pivotal. Dan Smith has been writing code ever since he typed in some BASIC from the back of a magazine in elementary school. For the last 10 years Dan has been working in distributed systems development. He's currently a Staff Engineer at Pivotal working on GemFire. How does Bodybuilding.com handle spikes in image upload traffic? Instead of attempting to predict load and have resources available for peak load, we are moving to the AWS Lambda service in order to dynamically scale our image processing functions. This will allow us to meet peak load and to reduce cost. 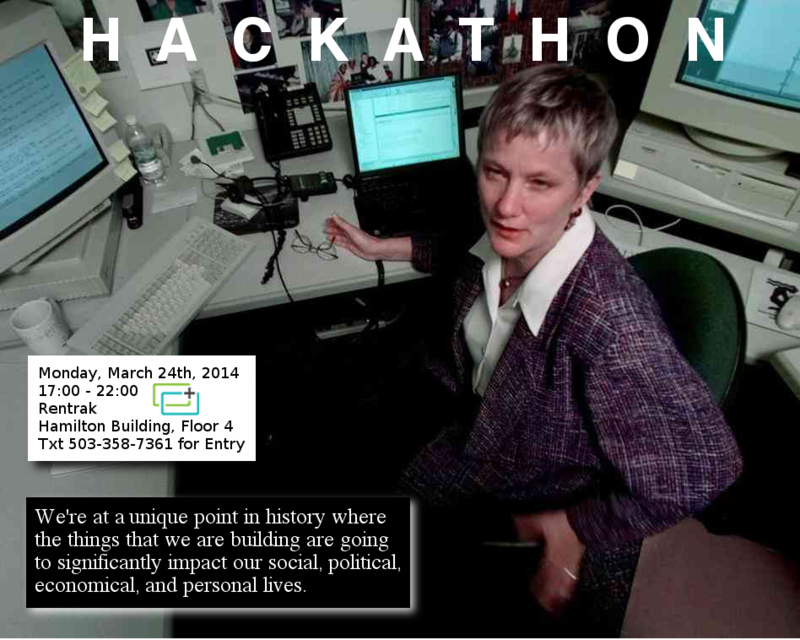 Whitney Hunter has been a software developer for 27 years. Over the last 15 years, he has been primarily focused on server side API development on the Java platform. Client side programming for HAL+JSON is flexible and extendable. Individual UI components are created server side and displayed via links. This architecture allows for code reuse and rapid application updates. Zachary Heusinkveld has been building client side applications for 7 years in enterprise and commercial spaces on Android, iOS, Windows and mobile web. Join us for pizza at 6 and the presentation will start at 6:30. Trask Stalnaker, author of Glowroot, will discuss how it has evolved over the past 5 years from a couple AspectJ pointcuts and a flat text file, to a full Java APM tool with tracing, profiling, timers, gauges, percentiles, historical rollups, error capture, sql capture, alerting, plugin architecture, agent API and more. Trask Stalnaker is a PJUG regular, author of Glowroot, long time Java programmer, and alumnus of Stanford University (Mathematics). JavaOne 2015 - Java 9 is Coming! Summary: This year at JavaOne, JDK 9 was one of the big topics. Many of the details of what's coming are summarized in this presentation. Come and see what's coming September 22! (Hint - think "modules"). Also included are other subjects of interest, such as better usage of Java 8, Project Valhalla, and others. Douglas Bullard has been doing Java for 20 years, most of them at Nike. Before that, he worked in aerospace on the Space Shuttle solid rocket motors. He holds degrees in Aeronautical Engineering and Computer Science. A brief introduction to Behavior Driven Development (BDD) and use of the Spock Specification Framework to achieve BDD. This presentation will provide a solid starting point for building BDD specifications in Spock and provide direction in which expand your knowledge of BDD as you delve into the Spock eco system. Through the course of nearly 20 years in professional software development, Jamie has promoted many rising paradigms that are in common practice today, including the use of Asynchronous Communication, Hypermedia as the Engine of Application State, Test Driven Development, and many others. Currently Jamie is brining Continuous Delivery and Deployment Automation to BodyBuilding.com and Behavior Driven Development and Automated Testing are key components of this strategy. Jamie lives by the mantra that software should be a pleasure to use and create. It's going to be on the 5th floor office!! All are welcome! Doors will open at 5:30pm. Socialize and get our development environments set up. Come and Leave as you please. This is a beginner/intermediate geared event. There will be Lebanese food to share. Or you may bring something of your own. 1) Build a basic Java web app using JSP and servlets. 2) Learn how to use IntelliJ IDE to build our Java web app. 3) Spin up a local Tomcat server on which to display our app. We will break off into groups depending on the number in attendance. Those with more experience developing will pair with those less experienced. Presentations at the end no matter how far you get. This month's speaker is Steve Hall who has 20 years of experience designing and delivering unique solutions to business problems. Steve is a Lead Software Engineer working with REST, big data and social solutions at Nike in Beaverton, OR. His current project enables millions of users on mobile devices to follow and just as easily stop following any digital content that may be of interest to them. The team has found that building these systems using REST and NOSQL can scale massively. However, achieving that scale requires some unique approaches for handling the volumes of data that needs to be stored. Tonight he will present an overview of what the team has learned about data modeling in a typical NOSQL datastore such as Cassandra or Dynamo. Following that he will discuss why traditional unit, integration, and performance testing approaches proved to be inadequate, and why the team went looking for a better solution. Having presented the problem, he will then present how the team has applied AKKA and Rest Assured to create a testing framework that proves the system is functionally correct at scale, and why it matters. Finally, he will close with a few insights for other ways that AKKA could be useful when working at large scale. Scala is an increasingly popular language for the Java VM. The Scala language has features that make it easy for Scala developers to write code that interoperates with Java code. We will discuss Java-Scala interoperability concerns such as collections, futures, and other common data types. Sean Sullivan is a Principal Software Engineer @ Gilt.com. Sean's recent projects include Gilt's Apple Pay implementation and new business logic for Gilt's merchandise return system. Doors open at 6pm for pizza provided by TEKSystems. The presentation will begin at 6:30pm. Robots have been in our minds for ages. Our imagination has been fed by science fiction, movies, books. But where are the robots to be seen today? You might wonder. At Aldebaran, we’ve been making robots for the last 10 years. Programmable humanoid robots. Social robots. Robots that don’t focus on performance but rather on interacting with people. We get the feeling they are the ultimate interface. But what are they useful for? How do they work? And more importantly: why should you pay attention to them? In this presentation, we'll invite Pepper on stage to do some demos, we’ll discuss software, hardware, sensors and emotions, we’ll share our vision about the future of robotics, and as much as we can, we’ll try to answer all the questions you have about this new species that will soon take over the world. Nicolas Rigaud joined Aldebaran four years ago as a community manager, after spending 9 years in the media industry. He is now developers advocate and manages relations with external developer communities. He’s strongly convinced that robots will change our lives in the years to come, and keep spreading the word all over the world. He's been talking at a range of events around the world (JavaOne, Devoxx, JFokus) and was awarded JavaOne RockStar in 2015. There has been a rise in the popularity of microservices. We will look at using Java EE in microservices with the help of WildFly Swarm. You will see how easy you can make a microservice of an existing Java EE project. James Perkins is a software developer at Red Hat working remotely from Portland, OR. He works as a core engineer on the WildFly Application Server, JBoss EAP, logging frameworks and JBeret (a JSR 352 batch implementation). In this session will talk about what is different about this generation of web applications and how a solid development approach must consider the latency, throughput and interactivity demand by users across both mobile devices, web browsers, and IoT. We will demonstrate how to include Couchbase, a NoSQL database, in such applications to support a flexible data model and easy scalability required for modern development. Nic Raboy is a Developer Advocate for Couchbase in the San Francisco Bay Area. He has released several native and hybrid mobile applications to iTunes and Google Play and writes about his development experiences related to making web and mobile app development easier to understand. He has experience in Unity3D, Apache Cordova, Java, NoSQL, SQL, GoLang, and Node.js. Google just announced that Google Play will now be supported on Chromebooks. The Chromebook is an inexpensive and lightweight laptop running the Chrome OS (and now apparently supports Android). Sounds awesome, right? So, let's get together and talk Chromebook Development. Food will be provided. Please keep your RSVPs updated so that we know how much food to order. Chris Anatalio is a Software Engineer at at Softsource Consulting(http://www.sftsrc.com/). He has close to a decade of experience crafting enterprise Java applications and has a passion for the full stack of technologies from responsive AngularJS front-ends to Java/Spring backends. He also holds a BS in Computer Science from Virginia Commonwealth University. He is very active on Social Media, Stack Overflow, Github and in technical blogging. In this presentation, we'll take a look at building HTML5 web applications in Java using the open source Vaadin framework. Vaadin takes a different approach to web application development by automating many of the most time consuming aspects of traditional web development. Instead of constructing your application from low level DOM elements and manually handling communication and data serialization, Vaadin takes care of server-client communication and allows you to work with higher level UI components in Java. The end result is a great looking HTML5 web application that you can use in any browser without plugins. During the presentation, we'll build a Vaadin application from scratch to demonstrate the basic principles and development practices hands-on. We'll take a look at why and when you would want to use Vaadin, and will of course investigate how things work under the hood. At the end of the presentation you should have learned enough that you can start building your first Vaadin application. Marcus has been working with web technology for the last 15 years on everything ranging from front end development to backend architectures. Currently Marcus works as a developer advocate at Vaadin, helping the web development community learn about new technologies through blogging, workshops, talks and a lot of demo apps. This talk will focus on data persistence strategies in Gilt's core systems: order processing, payment management, invoicing, and checkout. We'll discuss the Event Sourcing pattern and its implementation in a production system. Sean Sullivan is a Principal Software Engineer at Gilt. Sean has been a member of Gilt's backoffice team since 2011. VanderHouwen is forming a Java Developer meetup on the east side at Rogue Brewery. Join Andrew and Joe on the 4th Thursday monthly for happy hour. For this initial meetup, we’d like to purchase a couple of beers (or soft drinks) and talk about what you, as a Developer, want to see in a software meetup. We can book industry speakers for future events (and would welcome volunteers) or, have any format you wish. We want to build a user group for YOU so please join this Thursday to kick things off! Join us to chat about all things Java! We’d like to purchase a couple of beers (or soft drinks) and talk about what you, as a Developer, want to see in a software meetup as we build our community. We want to build a user group for YOU so please join us on Thursday the 27th to kick things off! ApiBuilder is a toolkit for building REST web services. ApiBuilder originated at Gilt.com as a better way to describe and document web service APIs. This presentation will discuss the history behind ApiBuilder as well examples of how it is being used in Gilt's production environment. Chris Hansen will be presenting an early version of a talk "It’s Good to Have (JVM) Options" he will be delivering at the JavaOne technology conference in October. Chris has organized technology events for youth in Portland and is a product manager for New Relic's Java agent. The Oracle HotSpot JVM has hundreds of command-line options for tuning performance for your particular application and workload. Which ones are the most useful and the most commonly used, and which are misused? New Relic monitors more than half a million JVMs. In addition to providing runtime performance data, the New Relic Java Agent reports JVM command-line options. By looking at anonymous JVM configuration data, we can draw out interesting patterns and trends. This presentation walks through some of the most commonly used JVM options and some cases in which certain combinations may have unintended consequences. You’ll come away with a better idea of when to use an option and when JVM defaults may be the best choice. Discuss how we're planning to help PJUG appeal to a broader more diverse audience. Chris Hansen will present his take-aways from JavaOne last month. Sean Sullivan from gilt.com will present on web application security and Apache Struts. This talk will examine the vulnerabilities from the Apache Struts framework. We will review the underlying Java code and discuss the fixes that were applied by the Apache Struts team. Sean Sullivan is a Principal Software Engineer at HBC Digital. Sean has been a member of the HBC/Gilt team since 2011. Join Tom Hanley from Skymind for an interactive tour through DeepLearning4j (DL4J), an open source, distributed, deep learning library for Java. This presentation will focus on machine learning basics and showing how to setup a development environment so you can run some of the canonical neurel network applications like image classification and text analysis with DL4J. To get the most out of this presentation, read through the brief https://deeplearning4j.org/quickstart tutorial so you can follow along with coding examples. This meeting will be a little different. There will be no microphones or projectors but everyone is encouraged to talk about a project they find interesting or show something they're building. Participation is totally optional but we hope to hear about any side projects you're working on, because a lot of times the most interesting things we build are built when we're supposed to be doing something else! Presentations are intended to be brief 5-10 minute talks. If you've got something you'd like to talk about, send us a direct message so we can add it to the agenda. Join John Blume from Pivotal to learn how existing applications can be modernized for the cloud by employing cloud-ready data management technologies, such as Apache Geode, which was built from the ground up on distributed, horizontally scalable (scale-out), shared-nothing architectural principles. When combined with the power of Spring running on Cloud Foundry, you have a recipe for protecting your existing investment while enabling you to leverage cloud-native design patterns that will move you towards the future. Join us for our first Portland Apache Kafka meetup on February 14th from 6:00pm. The agenda and speaker information can be found below. See you there! Gwen Shapira is a principal data architect at Confluent, where she helps customers achieve success with their Apache Kafka implementation. She has 15 years of experience working with code and customers to build scalable data architectures, integrating relational and big data technologies. Gwen currently specializes in building real-time reliable data-processing pipelines using Apache Kafka. Gwen is an Oracle Ace Director, the coauthor of Hadoop Application Architectures, and a frequent presenter at industry conferences. She is also a committer on Apache Kafka and Apache Sqoop. When Gwen isn’t coding or building data pipelines, you can find her pedaling her bike, exploring the roads and trails of California and beyond. 80% of the time in every project is spent on data integration: Getting the data you want the way you want it. This problem remains challenging despite 40 years of attempts to solve it. We want a reliable, low latency system that can handle varied data from wide range of data management systems. We want a solution that is easy to manage and easy to scale. Is it too much to ask? In this presentation, we’ll discuss the basic challenges of data integration and introduce design and architecture patterns that are used to tackle these challenges. We will explore how these patterns can be implemented using Apache Kafka and share pragmatic solutions that many engineering organizations used to build fast, scalable and manageable data pipelines. Special thanks to WeWork Custom House who are hosting us for this event. Don't forget to join our Community Slack Team (https://launchpass.com/confluentcommunity)! NOTE: We are unable to cater for any attendees under the age of 18. Please do not sign up for this event if you are under 18. Service gateways are a great new invention for improving the reliability and management of microservices. They provided nice features, like service monitoring, load balancing, creative routing, canarying, and fault injection. To learn more, join PJUG on Tuesday as Biju Kunjummen, from Pivotal, talks about service gateways, and about Netflix Zuul and the Spring Cloud Gateway in particular. Insecure deserialization was recently added to OWASP's list of the top 10 most critical web application security risks, yet it is by no means a new vulnerability category. Data serialization and deserialization have been used widely in applications, services and frameworks, with many programming languages supporting them natively. Deserialization got more attention recently as a potential vehicle to conduct several types of attacks: data tampering, authentication bypass, privilege escalation, various injections and, finally, remote code execution. Two recent vulnerabilities in Apache Commons and Apache Struts, both allowing remote code execution, helped raise awareness of this risk. We will discuss how data serialization and deserialization are used in software, the dangers of deserializing untrusted input, and how to avoid insecure deserialization vulnerabilities. Alexei Kojenov is a Senior Application Security Consultant with years of prior software development experience. During his career with IBM, he gradually moved from writing code to breaking code. Since late 2016, Alexei has been working as a consultant at Aspect Security, helping businesses identify and fix vulnerabilities and design secure applications. Aspect Security was recently acquired by Ernst&Young and joined EY Advisory cybersecurity practice. Eric Schabell (http://www.schabell.org), an evangelist director from Red Hat, will be presenting a hands-on workshop for OpenShift, JBoss, Ansible, (et al), including several container based java example projects. Insecure deserialization is one of the most critical web application security risks, yet it is by no means a new vulnerability category. Data serialization and deserialization have been used widely in applications, services and frameworks, with many programming languages supporting them natively. Deserialization got more attention recently as a potential vehicle to conduct several types of attacks: data tampering, authentication bypass, privilege escalation, various injections and, finally, remote code execution. Two recent vulnerabilities in Apache Commons and Apache Struts, both allowing remote code execution, helped raise awareness of this risk. Alexei Kojenov (https://twitter.com/kojenov) is a Senior Application Security Consultant with years of prior software development experience. During his career with IBM, he gradually moved from writing code to breaking code. Since late 2016, Alexei has been working as a consultant at Aspect Security, helping businesses identify and fix vulnerabilities and design secure applications. Aspect Security was recently acquired by Ernst&Young and joined EY Advisory cybersecurity practice. Hazelcast Essentials is a course designed for Java Developers looking to take their first steps in understanding In-Memory Data Grids (IMDG). By the end of the course the attendee will be able to construct Hazelcast Clusters and deliver basic caching services. The candidates should be familiar with Core Java concepts and APIs (collections, concurrency). Students will be introduced to the fundamental features of Hazelcast and how they may be applied to solve various use cases. This course is suitable for Developers and Architects with no prior or very basic knowledge of Hazelcast. Do you want to learn and share your passion in a supportive community? Free Knowledge Mission is an ethos of sharing, creativity, and inspiration. In this talk Steve Hall, Principal Engineer Next Generation Systems at Nike, will discuss why typical patterns used in Java EE may not work in microservices. He will show code and test examples using a progressive approach that incorporates Spring Boot, Spring Web Flux, Docker, and Kubernetes. The AWS SDK for Java version 2.0 is a complete re-implementation of the SDK for the Java language. It provides a modern API that leverages the latest capabilities from the Java platform. This presentation will highlight key differences between the V1 API and the V2 API. Also, we will examine the V2 HTTP layer and the updated API for AWS CloudMetrics. Sean Sullivan is a Principal Software Engineer at the Hudson Bay Company. HBC owns and operates multiple retail businesses, including Saks Fifth Avenue, Lord & Taylor, and TheBay.com. Sean has contributed code to the AWS SDK for Java project on Github. He lives in Portland Oregon. Sean Sullivan will be presenting on Tuesday about the evolution of microservices at the Hudson's Bay Company. 7pm-8pm at WeWork Pioneer Place. The Portland Java User Group is holding a meeting on Tuesday January 22nd at Oracle Portland (1211 SW 5th Ave #800 · Portland, OR). This meeting will have two speakers: 1) Ian Downard will give a short talk about a new OpenJDK distribution from Amazon called Corretto. 2) Chris Anderson from FaunaDB will talk about the principles of serverless databases and tradeoffs in guaranteed consistency and global replication.